NEXT STOP, FRESH GREENS Kara Strauss, founder and owner of Bloom Microgreens in Los Osos, is the proud owner of SLO County's first functioning mobile micro-farm. Pictured with the neon green school-bus-turned-micro-farm is her husband and biggest supporter, Adam, who found the green machine on Craigslist. The neon green school bus is parked on a sleepy residential street in Los Osos, but it would be better suited for a groovy 1970s music festival. There are no seats inside, only racks of budding greenery. Aside from the edible plants, it carries just two passengers. The rear passenger smiles out the back window—his cheery cheeks bleached white from decades of UV rays. The front passenger, a fresher, more modern gnome, dons a colorful pointed hat. He lives on the dashboard, overlooking the ample wheel (no power steering in this vintage baby). Day and night, the magical guards watch over precious cargo: Rows of tender micro greens bound for chefs' kitchens and local dinner tables across the region. Welcome to SLO County's first ever "mobile micro farm." If you haven't already gathered: It's a whole new world. Bloom Microgreens wasn't always so mobile or so quirky. Kara Strauss and her husband, Adam, once owned two traditional greenhouses—about 6,000 square feet of growing space—on Clark Valley Road in Los Osos. More recently, they moved across the street to a new property and expanded the operation to 8,000 square feet of vertical farming. Chefs and markets and restaurants continued to clamor for the zesty baby arugula, spicy radish, and crunchy bean sprouts, among dozens more varieties of delicious, nutritious greenery. Things were going great. Well, aside from the fact that the larger property surrounding the greenhouses had a way of attracting plenty of hungry rodents. As Kara tells me, mice are quite partial to basil. "We found the first garden gnome out in a field on the property, and he looked like he was lost and needed a home. So, we brought him in to protect our greens," she says. "He was the protector of the basil greens before he became the protector of this bus." We're standing outside the "green machine," and the afternoon sun is steadily sinking into the sea on this balmy Los Osos day. The bus is now a simple all-over bright green color, but it will soon be emblazoned with the farm's logo as well as the names of local sponsors, who helped get the hulking vehicle back on the road (The Tire Store donated tires; Empire Electric can be credited for those nifty interior grow racks). In the coming months, you'll see the bus acting much like a food truck: stopping at pre-scheduled areas across the region where the public can easily swing by and purchase all manner of fresh-cut micro greens. Customers will also now have the ability to pick up "living trays" that are completely biodegradable. It's a cool idea, but it wouldn't have happened without a little strife to shake things up. The big problem was this: The property they farmed was sold this past fall, and rent went through the roof due to lucrative marijuana growers moving in. It was only this past December when the couple struggled with how they might afford to keep their greenhouses flourishing. "I was totally defeated, I was totally done and in a funk. The new place offered us so much more room to grow. I thought maybe we should sell the business," Kara says of that stressful time. "Then, two days later, we got the idea." Instead of calling it quits and finding a tricked-out van to travel the country in, Adam suggested, "Why not put the business inside a van?" Well, "a van" quickly became "a bus" when Adam found the 1978 Gillig on Craigslist. "I took a bus to San Jose, hopped a train to Fremont, then Ubered to this guy's house," Adam says. "It was a fun drive home." The refurbished bus can now hold more than 400 growing trays, essentially compacting what was once 8,000 square feet of growing space into a 38-foot-long farm on wheels. Sure, the bus gets 11 miles to the gallon on a good day, but it has also allowed Bloom Microgreens to cut overhead costs and simplify its operation. Solar power will grace the roof in the future. Kara is excited about the possibility of showing up at local events and wineries, too. Educational shindigs and tastings are all on the roster. "As Bloom flourished in tandem with the Central Coast's incredible growth and exploding restaurant scene over the last 10 years, we realized a radical change was necessary to keep pace," the farmer adds. "A static, traditional model wouldn't meet demand forever. We needed something fluid, something that allowed us to serve more people; something that was able to reach further and on a more personal level." Personal? I'd agree. There is just something grounding about walking into a greenhouse. You smell the intoxicating scent of herbs and soil. The warm air is alive with growth. "The greenhouse just brings people down to earth. You can see people step inside and slow their breathing," Kara says. "We went from garage to green house to the bus. Now we get to really share that experience with more people." You heard it here first. Keep an eye out for the green bus filled with green stuff. Really, you can't miss it. Find Bloom Microgreens at Nature's Touch in Templeton, Shine Cafe in Morro Bay, the SLO Foods Co-Op, and restaurants from Paso to Pismo. Call (303) 908-4498 for more information or email bloommicrogreens@yahoo.com. 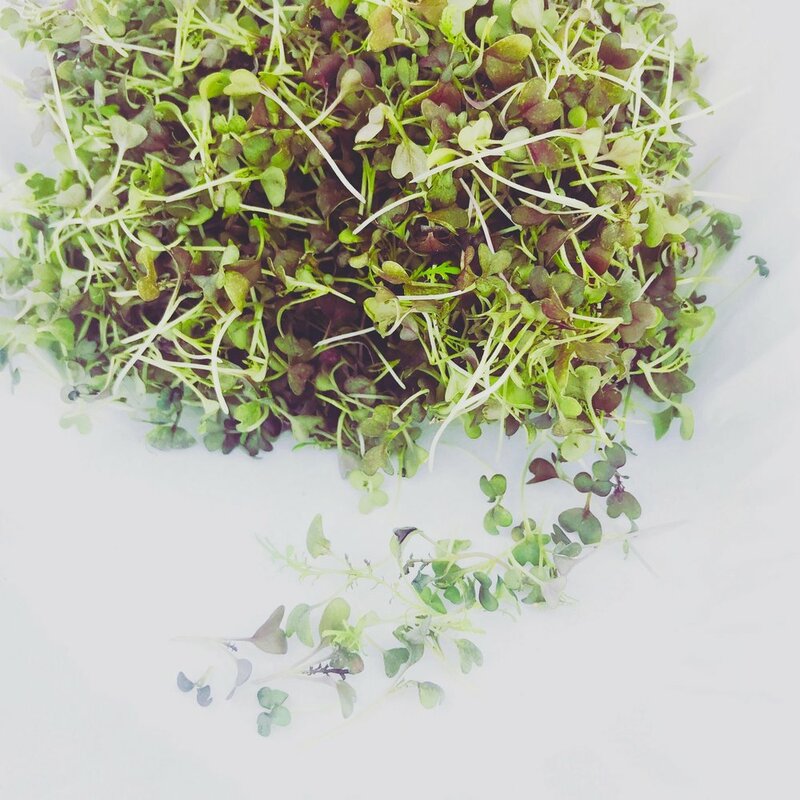 You can also follow @bloom.microgreens on Instagram for updates on pop-ups and stops.